The Pointe du Bois (“wooded point” in French) Generating Station was built on the Winnipeg River between 1909 and 1911, at a cost of $3.25M, by the City of Winnipeg. 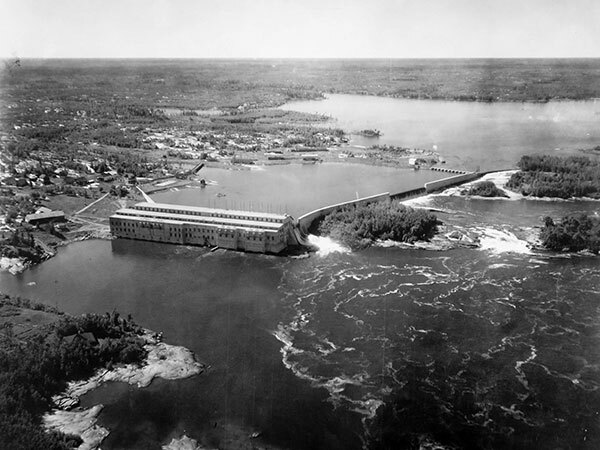 Its purpose was to supply power to the city in competition with the privately owned Winnipeg Electric Company, which had enjoyed a monopoly on power, gas, and transit, and had built a hydro dam at Pinawa. 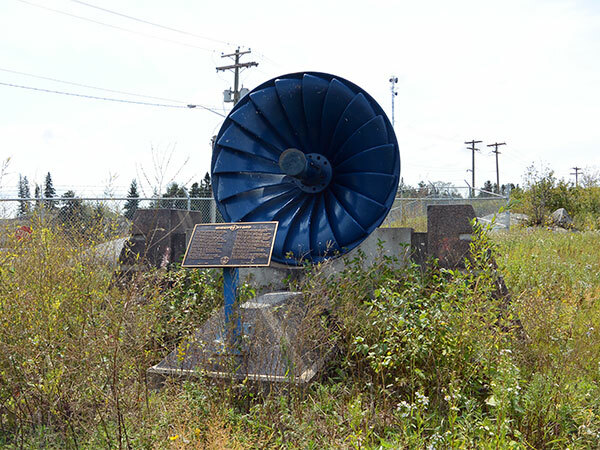 Pointe du Bois is now the oldest operating hydro plant in Manitoba. 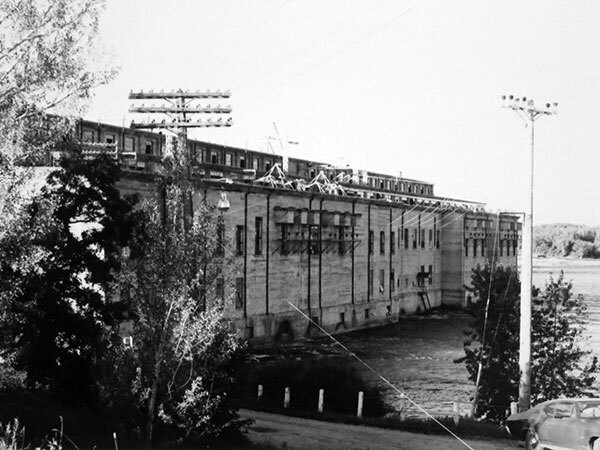 The first generator of the station was put into service on 16 October 1911 and the city created a utility called the Winnipeg Hydro Electric System (later, abbreviated to Winnipeg Hydro) to operate it. Power was transmitted to the city via a 77-mile power line. A terminal station constructed in 1911 at the corner of McFarlane Street and Rover Avenue in Point Douglas received power from the new station. The plant was completed in 1926 with installation of a 16th generator. 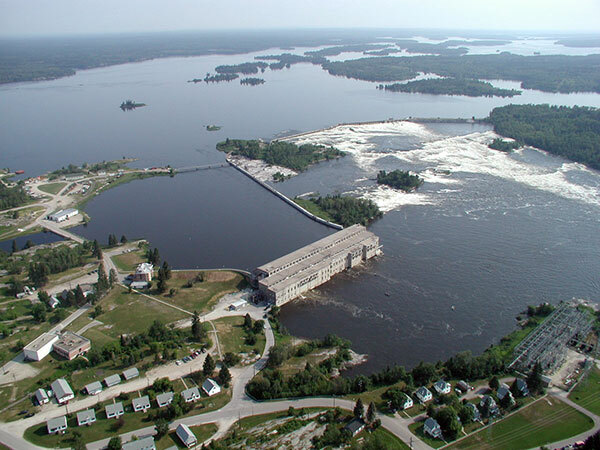 Today, the 75 MW output of Pointe du Bois pales in comparison with later stations on the Nelson River in northern Manitoba. Eventually, increasing demand in Winnipeg resulted in the construction of the Slave Falls Generating Station, six miles downstream from Pointe du Bois, in 1930-1931. 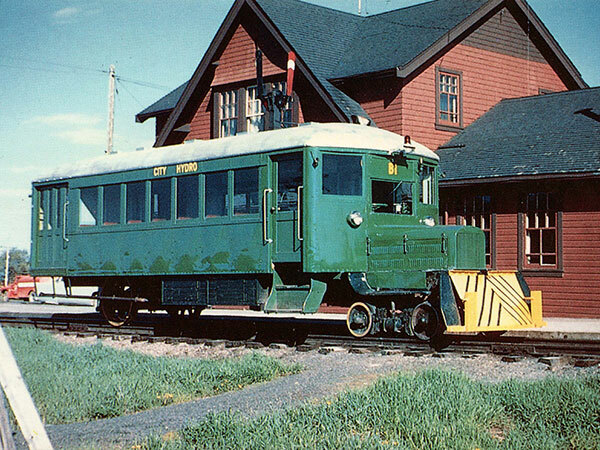 Initially, the only way into Pointe du Bois was by a tramway, completed in September 1908, aboard a 30-passenger, gas-powered bus equipped with railway wheels so it could run on the 25-mile railway between Lac du Bonnet and the station. In 1927, the bus made two trips a week, on Tuesday morning and Friday night, connecting to the CPR train at Lac du Bonnet. The first staff residence was built in 1908 and the first private residence was built in 1913, the latter a one-storey structure of hand-cut granite built by Italian stonemasons who had helped to build the spillway and powerhouse. A four-storey brick staff house (“men’s residence”) built in 1926. A community grew up around the station where employees and their families resided in houses constructed and owned by the company. Water distribution and sewage collection systems to these houses were installed in 1931. The town’s public amenities included a grocery store owned and operated by resident shareholders, multi-denominational church, community hall (dances, concerts, movies), medical clinic, outdoor swimming pool, and curling rink. Recreations included tennis, baseball, curling, skating, trapping, and fishing. There was a social club for men called N.O.O.B. (Noble Order of Benedicts, with 46 members in 1927) and for women called L.S.C. (Ladies Social Club). The children attended Pointe du Bois School, established in 1913. The beginning of the end for the Pointe du Bois community was in late 1941, when an all-season road was constructed to the site. From a population that ranged between 300 and 400, it had dwindled to 79 people by 1996. The school closed in 1981 and its building was used as recreation centre and administrative offices. In 1990s, Winnipeg Hydro commissioned engineering studies to examine the state of the sewer and water infrastructure. They concluded that considerable work needed to be done. Little work had been done when Winnipeg Hydro was acquired by Manitoba Hydro in 2002. In 2014, a new spillway structure came into operation, and the old spillway was sealed off, leaving a skeleton like at Pinawa. The original powerhouse continues to be used. 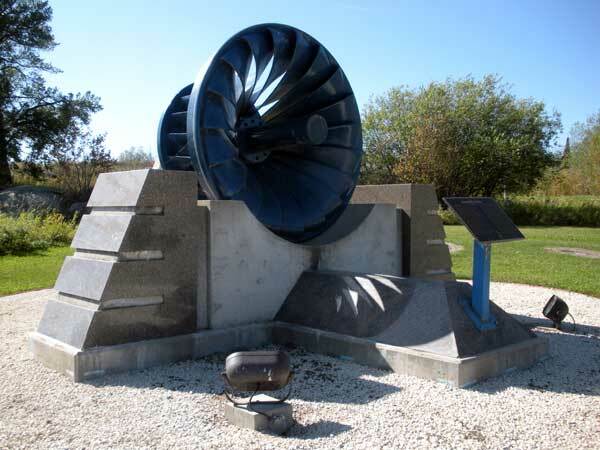 A Francis Turbine runner from Unit No. 1 in the powerhouse, manufactured by the Jens Orten-Boving & Co. of Sweden and used to drive a 3.5 megawatt generator, was retired from service in 1997. It was incorporated into a monument erected near the powerhouse on 27 June 2002. Demolition of the 44 buildings of the town began in 2013. The last residents were told to be gone by 1 January 2015. Reasons for the demolition were four-fold: 1) with an all-weather road to the site, there was no longer a need for a residential community; 2) the replacement of the original spillway with a new, mostly automated spillway reduced the need to have employees on-site, 3) the buildings were 80 to 90 years old and had structural problems, mould, lead paint, and asbestos floor tiles and ceiling insulation, with repairs estimated to cost $6.8M; and 4) town water and sewer systems needed upgrading at an estimated cost of over $900K. Street names in the former village commemorated prominent Winnipeg Hydro employees: Lee Briggs, John Glassco, Kenneth MacLeod, John Sanger, Samuel Square, and Thomas Storey. Source: Archives of Manitoba, Pointe du Bois #2, FA32-84. Source: Archives of Manitoba, Architectural Survey, Pointe du Bois #12. “Without a trace: Hydro town slowly being shuttered” by Bill Redekop, Winnipeg Free Press, 27 April 2013. Pointe du Bois Generating Station, Manitoba Hydro. We thank Edward Bricknell for providing additional information used here.